Take Sir Ken Robinson’s Changing Education Paradigms, mix it with self-help and progressive marketing for today’s connected world. 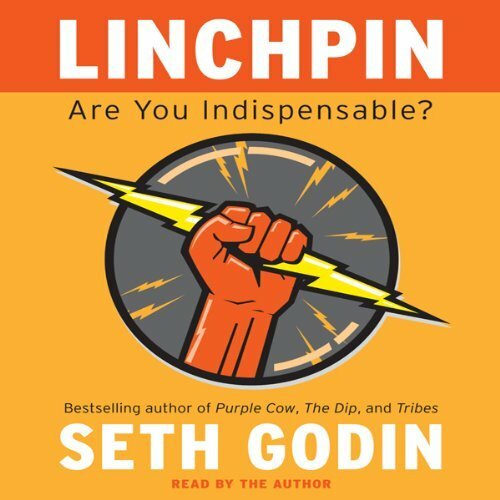 Now roll it out in an ‘Art of War’ like style and you’ll come close to Seth Godin‘s Linchpin – Are You Indispensable. Their contributions go beyond working hard or achieving ‘measurable’ excellence with a set limit. A linchpin exerts emotional labour, which Godin describes as the few minutes of brilliance they deliver unique interactions of exceptional value. As an example, he cites the emotional labour Richard Branson exerts to: see new opportunities, make decisions that work, and understanding the connection between his audience, his brand and his ventures. In this book, Godin outlines what it takes to be a linchpin with many examples, where they fit in today’s world, why there aren’t more linchpins and how to become one. Godin describes our transition from industrial jobs, where we were cogs in a system, to today’s new economy where linchpins are the building blocks of great organizations. He outlines obstacles that hold many potential linchpins back. In doing so, he touches on some of the points cited by Robinson in his lecture on the challenges with our rote learning education system. This system rewards traits like fitting in, waiting for instructions, avoiding risks and discourages creativity. This education sets the stage for the resistance or what Godin coins ‘the Lizard Brain.’ This villain is the part of our mind with our primitive, survival instincts that erode confidence and seek the easy route. According to Godin, the Lizard Brain’s foil is the Daemon, which is the part of our mind that is the source of great ideas, groundbreaking insights, generosity, love, connection and kindness. The Daemon encourages us to “ship” — that is complete a project in at least its first iteration. Godin sees shipping as key step in the long-term path to becoming indispensable, and as an action that’s threatened by the Lizard Brain. The book itself includes many inspiring stories of real linchpins, thought-provoking quotes and ideas. I found the descriptions of the seven linchpin attributes and their examples offered practical ideas. I also liked how Godin’s ‘need to ship’ virtue ties in with agile methodology. Unfortunately, I found sections of the book wordy, repetitive, disjointed and more detailed than needed to convey the core messages. It’s too bad Godin didn’t “ship” an abbreviated version, so we’d have more time to retool and become shiny linchpins. Today, few business can run without a website. It’s your ‘physical’ reception to the world and your interactive welcoming party. Web savvy start-up entrepreneurs, particularly those with low tech firms, can use one of many DIY tools to build and manage their own sites. The challenge is which site builder do you use? For some time, WordPress has been my ‘go to’ tool. One of my key reasons is because more than 23 per cent of the web’s sites use it and it seems the ‘de facto standard.’ Having seen many great technologies ‘eaten’ by dominant players (e.g. Beta vs VHS), I’m leery about deviating from this route. WordPress offers two main options: wordpress.com, which includes hosting and wordpress.org, which requires you to pay another supplier for hosting. I’ve used both and found them economical, easy to use and maintain. That said, newer site builder Squarespace is tempting. Like WordPress, Squarespace is cost-effective, has an user-centric Content Management System (CMS) and offers responsive templates. Squarespace also has several templates with up-to-the-minute design features and all its pricing options offer e-commerce. Although you can do online financial transactions on WordPress.com, its flexibility is limited since you must run them via one of its partners, such as Ecwid, Shopify or Gumroad. Content Management System (CMS) – Some reviews cite WordPress as easier to maintain than Squarespace but harder to set-up, particularly its WordPress.org version. For either WordPress option, it takes a few minutes to learn the terminology, such as the difference between pages and posts. Once setup, WordPress’ CMS interface is fairly intuitive and functions much like MS Word. You can also easily edit the HTML in WordPress. The jury is out on whether Squarespace is easier to learn and use or not. Some critics, such as Elegant Themes rate Squarespace’s page editor as more complicated to view and more work to use since you must use secondary windows to edit some elements. Other reviews, like one on wpbeginner, suggest Squarespace’s drag-and-drop functionality make it easier to use. Cost –Wordpress.com offers packages from $0 to $389 but you can create an effective site with a mix of à la carte options. For example, you can pay $24 per year to set up a custom URL that makes it easier to find. To give it a more professional look, you can pay $39 to omit ads, which seem to show up when the site is viewed on a network with many users. For wordpress.org sites, you can find external hosting for $3.95 per month (including domain name) through firms like Bluehost or SiteGround. In contrast, all Squarespace sites include hosting and cost $96 annually for a personal site (which limits you to selling one product via up to 20 pages) or $192 for a business site (which enables you to sell up to 20 products via unlimited pages). Customization and Flexibility – Although wordpress.com offers the upfront flexibility of more than 360 templates, one of its disadvantages is you can only make limited customizations, without incurring extra charges. In contrast, Squarespace only has 20 templates but you can edit its fonts, colours and CSS, even at the Personal site level. But this pales when compared to the more robust WordPress.org solution, which offers more than 27,000 templates and 29,000 plug-in features, enabling you to create unique sites for specific needs. Data Space and Image Handling – One review suggests early Squarespace versions limited site package users to 2 GB of space and wordpress.com offered up to 3 GB of space for free. However, Squarespace now offers the unlimited space advantage to all its users, while WordPress caps its free version at 3 GB (with the option to buy more). Squarespace also offers media perks, such as Getty image use at $10/image and more integrated image editing options than WordPress. Support – Most of the articles I read praise Squarespace for its support and lament Wordpress support. In reality, WordPress has always sent me useful answers to any of my questions within 24 hours. Squarespace’s flexibility and image features are ‘nice to have.’ However, I still think WordPress.com is the safer option because it offers numerous templates, as well as customization and e-commerce for a moderate price. 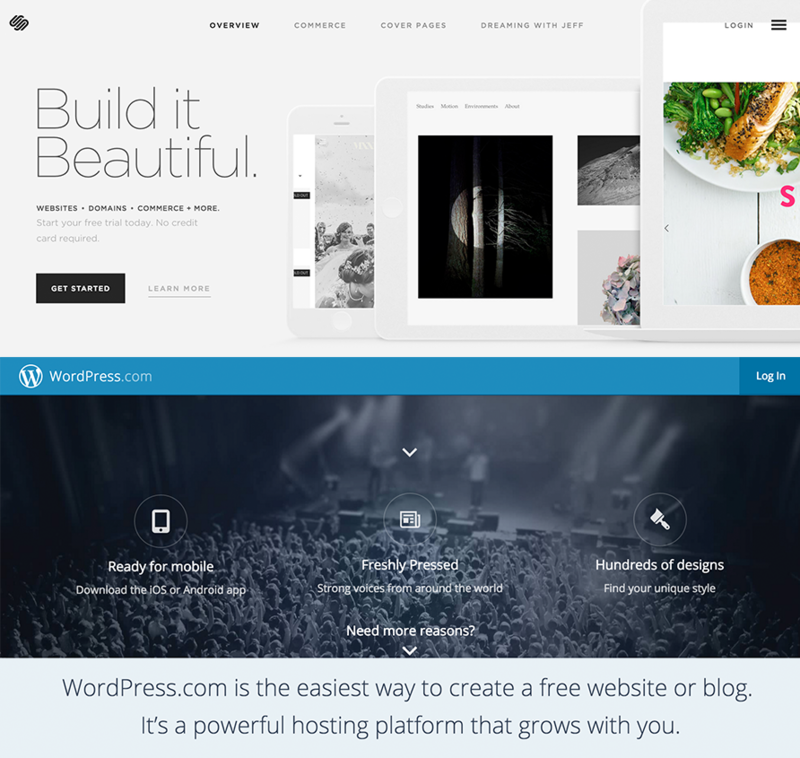 Plus, if your business grows and you need to scale up, Elegant Themes suggests you can and boasts WordPress’ strength for the long-term. I aspire to work in the healthcare sector or with Health 2.0 solutions to improve patient outcomes. However, I’m also open to opportunities in other sectors or a digital agency, particularly if I can create altruistic value, as well as revenue. My key goal is to work for a progressive but ethical organization that promotes a strategic approach to innovation, with a user-centred focus. I want to be a digital strategist who conceives end-to-end interactive strategies that meet users’ needs and engages them to meet specific goals across web, mobile, social platforms and possibly more as the IOT evolves. To become proficient at this, I want to first hone effective skills for defining the narrative and content that guides users through these strategies. More than anything I want to work with teams that support a best practice approach to user-centred design and value interactive narratives with diverse elements, from sliders to games. During the past eight months, I’ve discovered new disciplines, such as UX design, interactive strategy and narrative, video production and learned new skills, such as wireframing, prototyping, usability testing and video editing, with a range of tools. I’ve also acquired new best practices to build on my content strategy, project management, analytics, social media marketing, business, Photoshop and HTML/CSS mark-up skills. In some cases, I’ve also learned valuable lessons on how to position existing skills, such as user path development and content audits, that I didn’t recognize as marketable. I can also offer transferable skills from earlier careers, such as strategic planning, presentation development/delivery, copywriting, marketing, financial literacy, strategic communications, technical writing and diverse software skills. I think my interactive strengths lie in: end-to-end interactive narrative and content strategy development; social media marketing; and possibly analytics. I think I’m particularly good at deciphering needs, identifying gaps or opportunities and explaining/presenting concepts. I also have a strong grasp of UX design, usability testing, wireframing and graphic design. And when needed, I can use basic HTML/CSS skills or troubleshoot software to create a quick fix or workaround. I want to attain a field placement in small agency or private organization with a strong digital focus. I think a small organization will give me a better grasp of how digital divisions work together and might offer more hands-on opportunities at varied tasks. At this point, I’m pursuing a placement at a diverse, entertainment start-up with an innovative team. My top learning priorities for my placement are to take part in: user needs identification (possibly personas and user paths); strategy sessions; narrative and interactive content development; analytics and maybe even wireframing. It would also be wonderful to participate in script writing or video production but these are passions versus priorities. I understand my potential field placement organization needs help with a crowd-funding campaign, supported by social media. Although I’ve never crowdfunded, I have run social campaigns and would be happy to help with these fundraising tactics, as long as I don’t forfeit my top priorities. At the end, I hope to discover some new digital best practices or cautions, a clearer understanding of my value proposition to the interactive field and a real world addition or two for my portfolio. I think my biggest challenges will be keeping my focus on interactive digital tasks and trying not to achieve mammoth results in 315 hours. 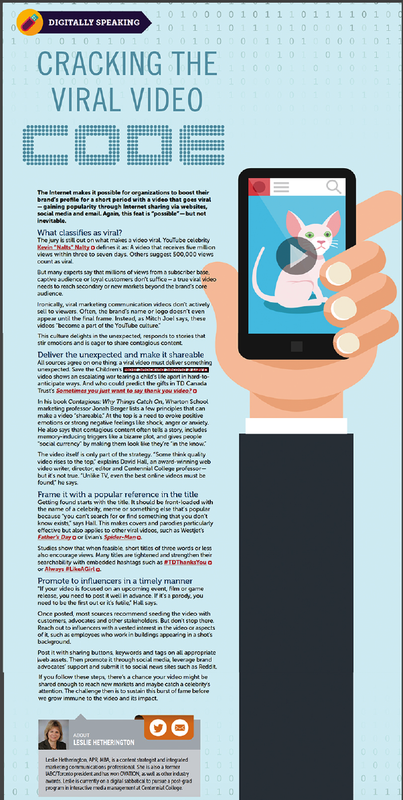 In early April, I published a ‘how to’ article on viral video for IABC/Toronto’s Communicator. Download a PDF of the article or read the expanded version below, citing current insights and 2014 viral hits. The Internet makes it ‘possible’ for organizations to boost their brand’s profile for a short period with a video that goes ‘viral’ – gaining popularity through Internet sharing via websites, social media and email. Again, this feat is ‘possible’ – but not inevitable. The jury is still out on what makes a video ‘viral.’ YouTube celebrity Kevin Nalty’s defines it as: A video that receives five million views within three to seven days. Others suggest even 500,000 views over a few weeks provides tremendous value. Other experts say that millions of views from a subscriber base, captive audience or loyal customers don’t suffice. A ‘true’ viral video needs to reach secondary and new markets beyond the brand’s core audience. Ironically, viral marketing communication videos don’t actively sell to viewers. In many cases, the brand’s name or logo doesn’t even appear until the final frame. Instead, as Mitch Joel says, these videos “become a part of the YouTube culture.” This culture delights in the unexpected, responds to stories that stir emotions and is eager to share contagious content. All sources agree on one thing: a viral video delivers something unexpected. Save the Children’s Most Shocking Second a Day video uses escalating disruptions to show war tearing a child’s life apart in hard-to-anticipate ways. And who could predict the thank-you gifts TD Canada Trust’s ATM gives in its Sometimes you just want to say thank you video? In his book Contagious: Why Things Catch On, Wharton School Marketing Professor Jonah Berger, lists a few principles that can make a video ‘shareable.’ At the top is a need to evoke positive emotions or strong negative feelings like shock, anger or anxiety. He also says contagious content often tells a story and includes memory-inducing triggers, like a familiar term or bizarre plot that keep it top-of-mind and compelling to share. Contagious content also gives people ‘social currency’ by making them look like they’re ‘in the know.’ Similarly, sharing charitable or socially conscious videos gives people a feeling of altruism by association. The video itself is only part of the viral code. Positioning, timing and targeting the right audience also play key roles in spreading a video. “Some think that quality video rises to the top,” explains David Hall, an award-winning web video writer, director, editor and Centennial College professor – but it’s not true. “Unlike TV, even the best online videos must be found,” he says. Getting found starts with the title. It should be front-loaded with the name of a well-known event, meme, celebrity or something else that’s popular because “you can’t search for or find something that you don’t know exists,” says Hall. This makes covers and parodies particularly effective but also applies to other viral videos, such as Westjet’s Father’s Day, Evian’s Spider-Man or Turkish Airlines’ Drogba vs. Messi videos. Hall notes the title usually tells the story or creates a sense of irresistible mystery. As with media relations, you can also look for various angles to appeal to multiple audiences and incorporate them in the description with relevant keywords. Studies show that when feasible, short titles of three words or less also encourage views. Many are tightened and made easier to find with embedded hashtags such as #TDThanks You or Always #LikeAGirl. If your video is focused on an upcoming event, film or game release, you need to post it well in advance, ideally at the beginning of the week. If it’s a parody, timing is tighter. “You need to be the first out or it’s futile,” Hall says. Once posted, most sources recommend seeding the video with your inner circle of customers, advocates and other stakeholders. But don’t stop there. Reach out to influencers with a vested interest in the video or aspects of it, such as employees who work in buildings appearing in a shot’s background. Post it with sharing buttons, keywords and tags on all appropriate web assets. Then promote it through social media, leverage brand advocates’ support and submit it to social news sites such as Reddit. With contagious content, effective positioning and timely promotion, there’s a chance your video might be shared enough to reach new markets and maybe catch a celebrity’s attention. Cisco predicts online video traffic will comprise 55 percent of all consumer Internet traffic by 2016. Maybe it’s time to add a ‘YouTube culture’ video to your marketing plan. Building on the definition my partner and I developed in an early class, I define interactive narrative as: A story that uses digital media to engage the audience in a user-centric experience that motivates them to follow a linear or non-linear path, which ultimately achieves stakeholders’ goals. What I’ve since discovered is how interactive narrative adds multiple dimension to traditional storytelling. Like most stories, it has place, characters and plot but there are various layers within each. The hero or central character is always the user and may be alone or one of many. Stakeholders and partners also play pivotal roles, often as masterminds behind the experience. And the plot is rendered through: varied levels of interactivity, prompts for open or closed input, metaphors, emotions and communication that imparts knowledge and elicits change. I never thought that each story or experience we encounter creates change and some form of new knowledge. I also have a new respect for latent knowledge and the long-term value it provides. I think it’s interesting how an interactive experience can ‘wake-up’ this latent knowledge and connect it to conscious thought. Through various in-class exercises and assignments, I also gained a greater “hands-on” understanding of interactive narrative and how it can effectively integrate with technical solutions, websites and apps. Many of them made me to consider technology in different ways. Assessing interactive experiences in terms of audience numbers and levels of interactivity showed me the range of options. It also made me recognize even minute levels of interactivity, such as Banksy’s provocative streetscape murals. The final assignment with the three somewhat conflicting variables of: responsiveness versus resolution; optimization versus ubiquity; and customization versus design, forced me to look at tradeoffs to consider and mitigate in each project. Moving projects to another place or for another stakeholder gave me a new approach for brainstorming new ideas both online and offline. Although I still face ‘writer’s block’ when I begin to sketch out an interactive concept or wireframe, in class exercises, such as developing a user flow, storyboard or user’s journey helped jolt me forward. Developing a user flow for my senior project and then opening it to critique from my team proved beneficial. During this exercise, my team members highlighted the opportunity to integrate a search process differently and skip a step, which I might have otherwise missed, possibly because I’m so close to it. With this third-party insight, I developed a smoother search option, which plays out well in my prototype. Most importantly, learning about interactive narrative and its many layers has given me new insight into how we are potentially moving toward a rich era of co-creation, where designs are created by diverse people/teams. And if this optimistic predication proves true, I can’t wait to see how the world improves as we advance toward it. I met with D. again on the Saturday before the Monday when our prototypes were due. At that point, I had revised flow charts, a site architecture map, mobile screens developed for two scenarios and a few tablet screens. D carefully reviewed my work and even though he initially said he only had an hour, he found the work interesting and delayed his departure by about 45 minutes. Although it was tempting to save time and proceed with the wireframes I had, I couldn’t do so after D had flagged improvement opportunities. This meant spending a good portion of Sunday revising the screens and working through the night to deliver the prototype on Monday. With my prototype completed, I met later in the week with M. and two agency colleagues of hers: a content strategist (S) and a strategist (J). M had kindly set-up the opportunity for me to present my project and hear their feedback. I introduced my concept with the banner designed for Digifest (as my project is part of the upcoming student exhibit) and then walked them through my prototype. M. and her colleagues like the targeted focus of my project, its content and the UX features I’d incorporated. They offered numerous recommendations to strengthen the solution and highlighted a few best practices to sustain. Ensure a consistent voice and tone throughout the site, as often this is lost after the initial pages. I was pleased by how supportive they were and surprised to hear J. say that with a few tweaks, my concept would be ready to move to the next stage of bringing a developer on board. I didn’t think I was that close but who am I to challenge mentors with light years of digital experience on me?